Discover the strange, the shocking, and beautiful at Ripley's Believe It or Not! on Light Street Pavilion. 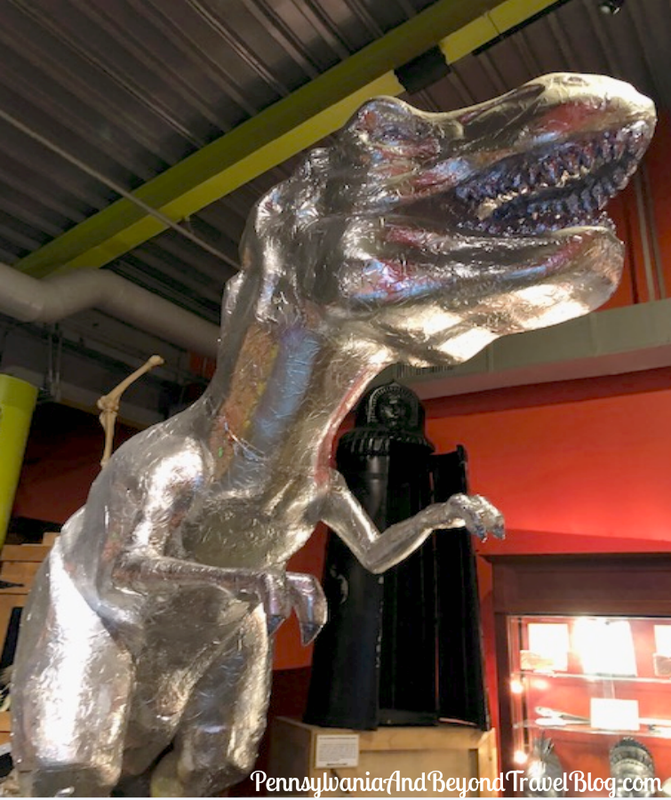 Enjoy some eye-popping exhibits where you can pose with a 12ft tall scrap car parts sculpture, lose yourself in some mind-boggling visual illusions, and even see a Fiji Island mermaid! The array of weird will leave you awe-struck. You've found your one-stop family fun in Baltimore! * Complimentary Family Passes Were Provided for this Feature. Reading about it is one thing, but seeing it is another. Located on 301 Light Street Pavilion in Baltimore, Maryland, Ripley’s Believe It or Not! Odditorium is open Sunday-Thursday from 10 am-8 pm AND Friday & Sunday from 10 am-10pm. 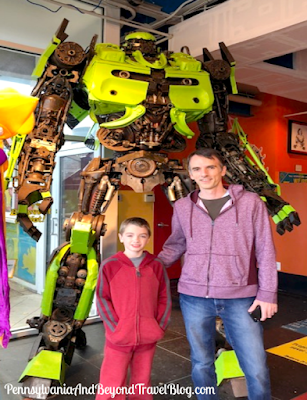 If you are looking for a fun family day trip, then I highly recommend you check Ripley’s Odditorium out. 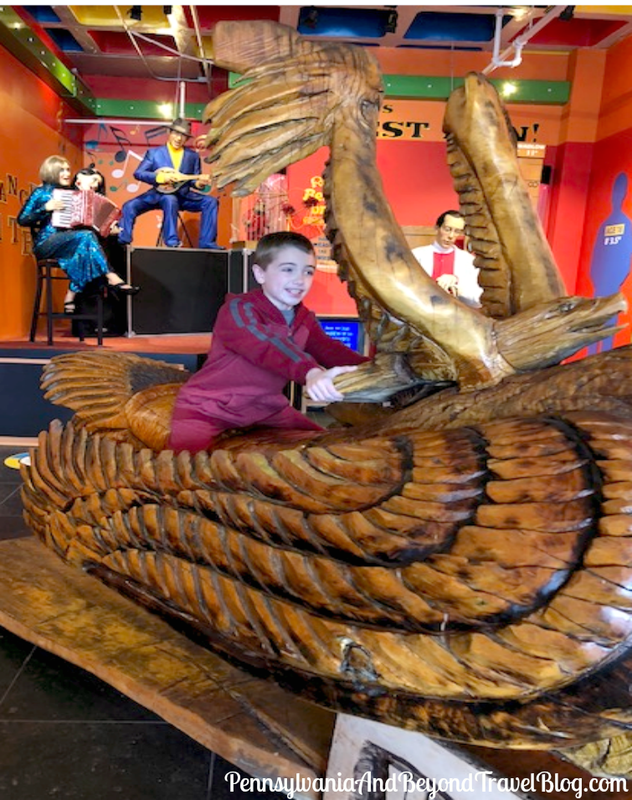 • Ripley’s Odditorium: features the largest collection of the odd and unusual from all corners of the world. See a genuine shrunken head; see how you measure up to the world’s tallest man, and a 6-legged pig! Single prices range $11.99-$17.99. • Ripley’s 4D Moving Theater: powered by Real D 4D technologies. Seats move in eight directions. Features two action-packed films with continuous showings throughout the day. Single prices range $8.99-$12.99. • Ripley’s Smash Dash: similar to Whack-a-Mole where you battle it out to hit the most colored buttons in a short period of time. Single prices range $3.00-$4.00. Ripley’s Odditorium also offers combo tickets. The more you do the more you save. 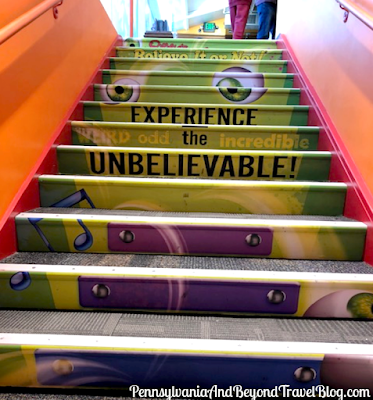 Visit https://www.ripleys.com/baltimore/ for pricing options. We had a great time at Ripley’s Odditorium. Conner’s been bugging to go ever since he opened his first ever Ripley’s book last Christmas. It was a cold Saturday day when we decided to check it out and, I am so glad we finally did. There is so much to see, read about and participate in at Ripley’s Odditorium. This is a great place to spend a few hours seeing and reading about some of the pieces in Ripley’s collection. 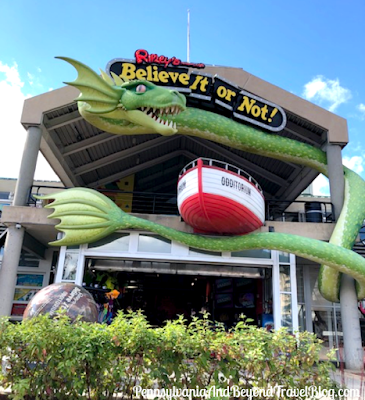 Ripley’s Odditorium is two stories high. To go upstairs, you walk up musical stairs. The steps play notes on a piano. Conner and I had a lot of fun running up and down the stairs listening to the notes being played. 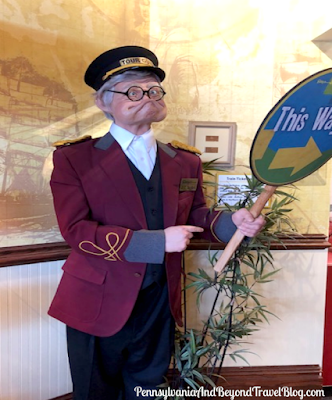 Throughout the Odditorium you will run into this fellow. He helps guide you through the museum so you won’t get lost. He’s funny looking and made us laugh as we walked throughout the museum. Driftwood Art: Oceans 11th Hour – Ocean’s 11th Hour is Palm Coast, Florida artist Baliker’s effort to call attention to the peril that the world’s oceans and sea life face at the hand of humankind. 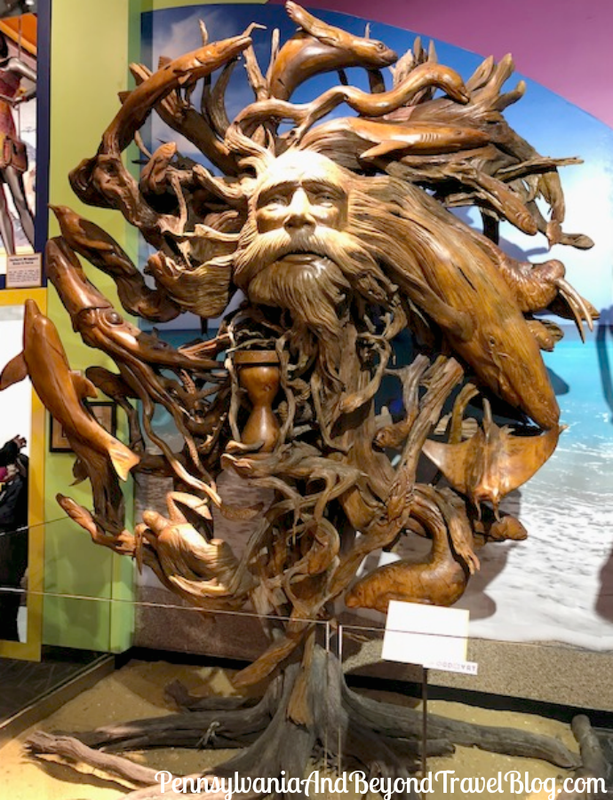 The sculpture stands eight feet high by ten feed wide and is made entirely from pieces of old cedar driftwood found on the islands off Cedar Key, Florida. The portrait in the center of the piece is Father Time. Tangled in his hair and beard are over 20 depictions of sea creatures and fish, several which are native to Florida’s coastal waters. This stood out the most to me because of the exquisite detail. I can only imagine how long this took to make. I also like that it represents something important to the artist…protecting our oceans and sea life. 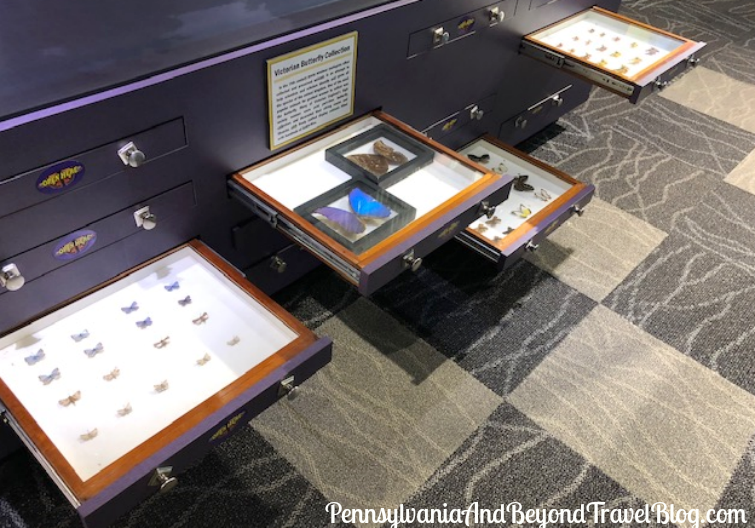 Victorian Butterfly Collection- In the 19th century many amateur zoologists often collected and preserved animals in an attempt to help scientists and scholars identify and name all the species of the animal kingdom. One of the most popular animals for genteel women to collect was the butterfly. Many of Victorian England’s high society women were avid part-time butterfly collectors and decorated their sitting rooms and libraries with finely crafted display cabinets filled with hundreds of butterflies. This resonated with my husband because he loves butterflies. Growing up he read a lot about them. This resonated with me because my grandmother loved butterflies. Every time I see a picture of a butterfly or a butterfly flying, it reminds me of her. Ripley’s Odditorium has a lot of interactive activities. 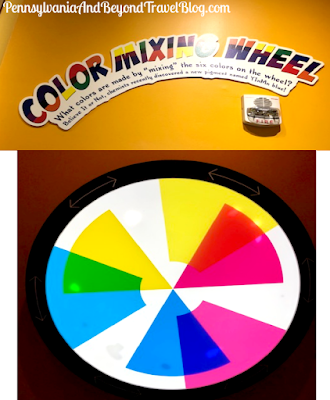 One of the activities was the color mixing wheel. I had fun watching Conner make different colors. This is a great activity for children of all ages and takes less than a minute to show. Pop-Tart Foil Tyrannosaurus Rex-Built by Tyler Kozar of Pittsburgh, Pennsylvania, this dinosaur is made from 4”x4” foil pop-tart packages. Tyler won one million pop-tarts in a contest. He then turned his prize into 15 different pieces of pop-tart art. This dinosaur is the largest of his sculptures. Tyler donated all of the actual pop-tarts to charitable food banks. The statue stands over 14-feet tall and took six cans of spray glue and 150 hours over the course of one month to complete. Conner liked this sculpture, because it reminded him of his favorite movies, Jurassic Park and Jurassic World. 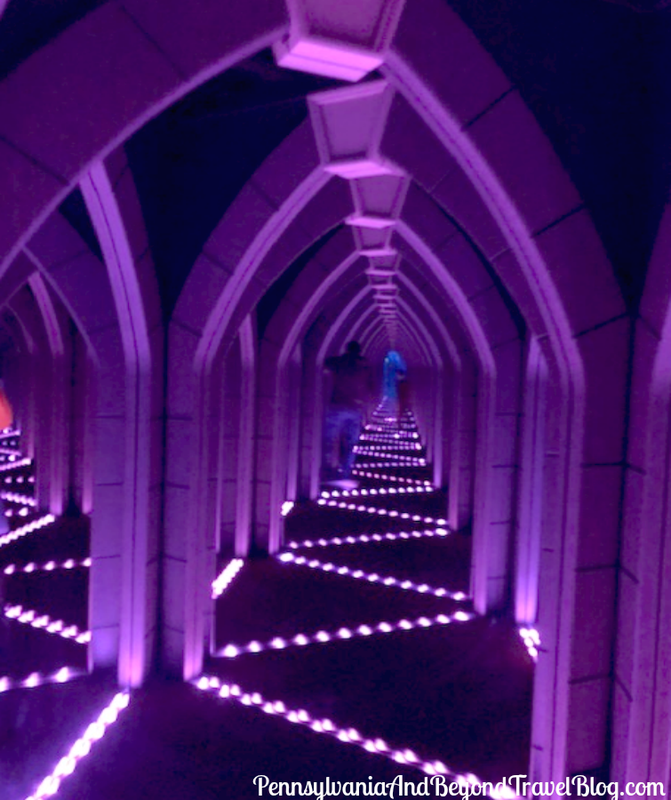 Without a doubt, the Mirror Maze was our favorite attraction at Ripley’s Odditorium. It’s full of mirrors and lights and it’s really hard to find your way around. My husband and son were champs at finding their way out…me, not so much. I got lost many times trying to find my way. My husband has to come back for me multiple times. I even ran into the mirrors on several occasions. Let’s just say, I have no sense of direction. 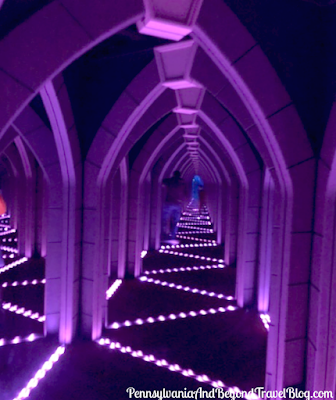 I loved how the mirror maze was all lit up. The lights change color throughout the maze. But as you can see, it’s easy to get lost and run into a mirror, especially when you think you are going the right way. 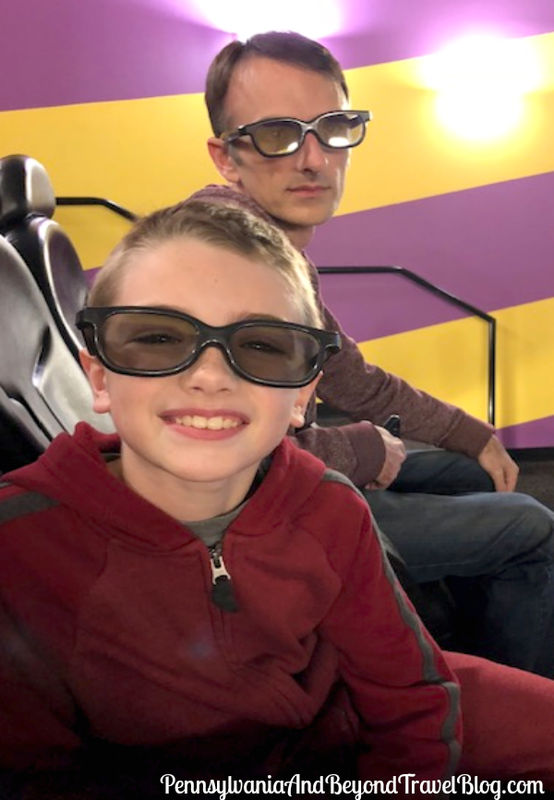 Last attraction we did was the 4D movie. Conner’s never experienced a move in 4D before, but he really enjoyed it. We got to experience two five-minute movies. One of the movies involved a space battle between fighter planes and an evil robot and the other movie involved Santa, his sleigh, and a race to deliver a child’s Christmas package in time. You really felt like you were in the middle of both movies. Definitely not for the faint hearted. Overall, we had a great trip. There was something that each of us enjoyed, and I loved spending time as a family. It didn’t cost a lot, and we had a happy kid at the end of the day. 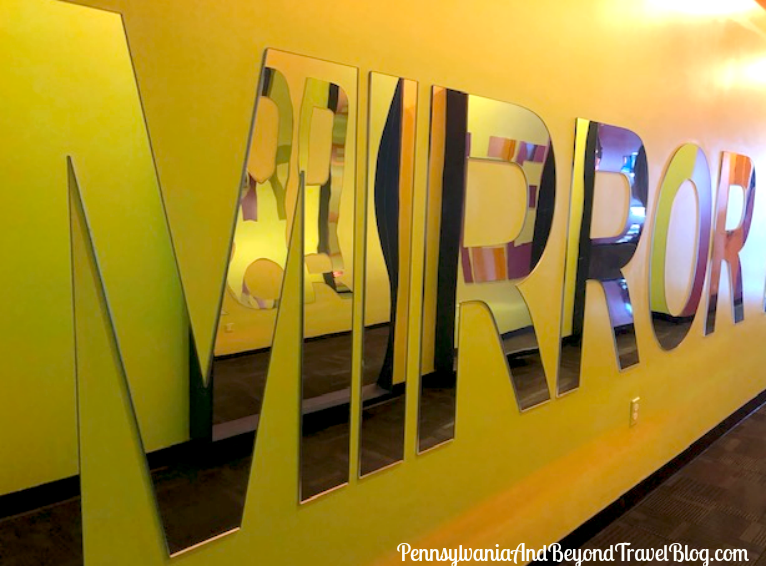 So if you are looking for a fun day trip, then I recommend checking out Ripley’s Odditorium. You won’t be disappointed!!! Disclosure: Guest travel blogger Sara K. received complimentary admission for this travel feature. Regardless, Sara's opinions, thoughts and words are 100% her own unbiased opinion. Your thoughts may differ. No monetary compensation was received for this review/feature.